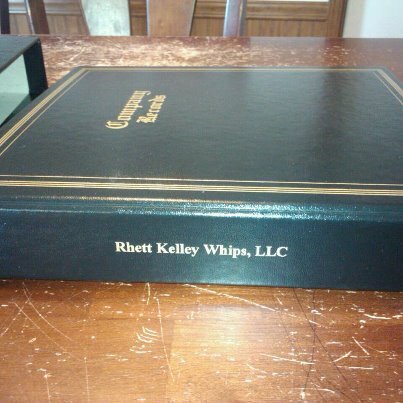 On 9 July 2012, the sole proprietorship commonly referred to as “Rhett’s Whips” was organized in the State of Georgia as Rhett Kelley Whips, LLC. After becoming a full time whipmaker in May, I decided it was about time to further legitimize my whipmaking business. I went with an LLC (Limited Liability Company) because it is somewhat of a hybrid between a corporation and a partnership. It provides simplified management and the liability protection of a corporation. The impact of this change will be minimal because the LLC won’t really change much about how I’ve already been doing business as a sole proprietor. I mostly decided to go this route because of business liability. It’s something I’ve had on my mind for a long time. As whipmakers, we make a product that can injure someone. We hope people take our advice to wear safety glasses and protective gear, but I’d bet most don’t. Sure, most whipmakers put notices on their website saying their not responsible for any injuries or misuse, but how well will that hold up in court if someone decides to take legal action because Lil’ Johnny put his eye out with his new bullwhip? Probably not very well. Today all business owners should be looking into ways of protecting themselves from business and product liability. You might look at your whip business as “just a hobby” and think that will protect you, but a personal injury attorney will see it differently. If you’re unprotected, all of your assets are at risk. With an LLC, the members of the company are not personalty liable for debts or claims against the LLC. That combined with business liability insurance could potentially save lots of headaches in the future. Of the whipmakers I know personally, the only one I know for certain that has an LLC is James Emory of Classic Bullwhips. Ironically, getting protection for your business isn’t as expensive as you might think. For tho se who have been thinking of forming an LLC or other corporation, let me suggest using MyNewCompany.com. I found their URL on a website where I go for financial advice and saved $330.00 over Legal Zoom! If you’re interested in forming an LLC, click on the ad box. If you want to save even more, enter the code “MNCRF” at check out and you’ll get a 15% discount. This entry was posted on Thursday, July 19th, 2012 at 7:24 am	and posted in off topic, Uncategorized, whip makers. You can follow any responses to this entry through the RSS 2.0 feed.